John Isner took to the Stadium Court on Sunday afternoon at the 2014 BB&T Atlanta Open singles final with three things on his mind. For one, he was trying to win his ninth career ATP World Tour title and defend 250 ATP points that he earned by winning in Atlanta last year. He also knows he has a lot of tennis ahead of him for the next 45 days, and a win today could serve as a launching pad to help raise his ranking back into the top 10. Finally, with a heat index at or near 100 degrees, it was crucial that he take advantage of his height and serve to keep the points short, allowing him the best opportunity to win. His opponent Dudi Sela had one thing on his agenda. How would he return Isner's serve on the high bouncing Stadium Court at Atlantic Station? While the big-serving American and defending champion was able to handle the three issues he was facing coming into Sunday's final, Sela was left guessing trying to return Isner's first and second serve throughout a 6-3, 6-4 loss. "RIght from the beginning I felt great on the court, explained Isner. "Getting that early lead helped a lot. I was able to get up early and I was serving first as well, so I was playing from ahead pretty much the whole match." Getting an early lead is always a good thing for Isner. In six of his nine ATP World Tour wins, Isner was able to gain a break in the first set. That momentum in all actuality carried him to victory. "I like that situation a lot," stated Isner. Sela noticed that Isner was more relaxed and picked up his game after he broke early. "It changed his game," said Sela. "He was able to go for it." Sela said he also had to deal with playing during the daylight hours. "All my other matches were night, so this was different conditions." Isner concurred. "It wasn't so much he was feeling the heat, but the conditions were different." As other Isner opponents found out during the week, it's true, the ball bounces much higher during the day." "The ball is so lively out there and my serve is tougher during the day," added Isner, who takes the early lead in the Emirates Airline U.S. Open Series standings. The second set was more of the same, but with Isner breaking Sela in the fourth game. Isner saved one break point late in the second set, but closed out the match with a 139-mph ace down the center, to claim yet another ATP World Tour 250 title and confidence heading into the rest of the summer. 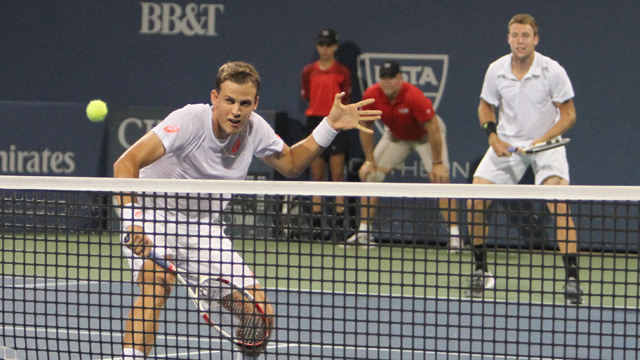 The 2015 BB&T Atlanta Open will be held one week later than its previous spot on the ATP calendar. One additional week is being added to the British grass court season. The 2015 BB&T Atlanta Open will be held July 25 to August 2.